For the nearby mountain, see Mount San Antonio. 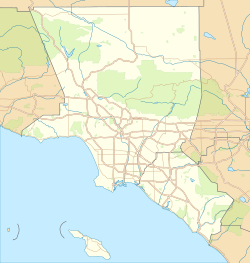 Mount Baldy or Mt Baldy, formerly Camp Baynham and Camp Baldy, is an unincorporated community in the San Gabriel Mountains, in San Bernardino County near the eastern border of Los Angeles County, in Southern California. It is located below Mount San Antonio (Mt Baldy) in San Antonio Canyon. San Antonio Creek flows through the community. It is surrounded by Angeles National Forest. Mt Baldy is 12 miles (19 km) north of Ontario. Mt Baldy has a post office with ZIP code 91759. The community was established as Camp Baynham in 1906; it changed its name to Camp Baldy in 1910 and became Mt Baldy in 1951. Its post office was established in 1913. The Mt Baldy School District operates the Mt Baldy School in town. The Mt Baldy Zen Center is located in the area. The Mt Baldy Ski Lifts are above the town on the slopes of Mt Baldy. Mt Baldy has relatively cold winters with moderate snowfall. Temperatures often fall to 30 °F (−1 °C) at night. It is usually 39–49 °F (4–9 °C) during the day during the winter, and 25–35 °F at night. Annual snowfall is about 42 inches. Summer temperatures are mild to warm, and can get chilly at night. 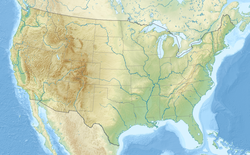 Daytime temperatures are 76–86 °F (24–30 °C), with lows of 49–62 °F (9–17 °C). Thunderstorms are not common, on occasion they brew in the mountains in and surrounding Mt Baldy. They usually occur in the afternoon, and clear up by late evening. ^ Durham, David L. (1998). 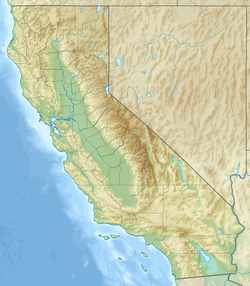 California's Geographic Names: A Gazetteer of Historic and Modern Names of the State. Quill Driver Books. p. 1447. ISBN 1-884995-14-4. ^ "MOUNT BALDY, CALIFORNIA (91759)". weather channel. Retrieved 10 October 2017.